Do you remember Angel Hair? 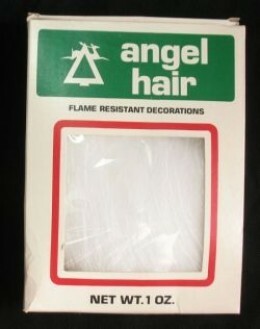 Angel Hair was a popular Christmas decoration. It was made out of spun glass (fiberglass) and it was used for Christmas tree trimming, Nativity Scenes, Santa’s Whiskers, and Religious Decorations. Many people love how it looks around lights as it refracts light and makes the tree seem to glow. However, it can be very itchy if you get it on your skin, and there are other possible health concerns, so most stores don’t sell it any more. If you are looking to buy it, you might have to buy it online….. Here are some links to where you can buy it below. However, please be very careful as to how you handle it! Angel’s Hair is a truly beautiful decoration on a tree as it refracts light. Buy Angel Hair on Amazon – Can’t find it in stores? Get it online. This is the modern version of Angel Hair. It is flame resistant! People love using it for decorating around Christmas.. and Easter too. However, please read the health warnings below. Is Fiberglass Dangerous? – The answer is Yes, but how dangerous we don’t know. How does fiberglass affect your health? Is Angel Hair a great decoration or a danger? – Tell me what you think! Do you love Angel Hair and wish it was easy to find in the stores these days? Or do you hate it and have terrible memories of feeling itchy all over? I’m too young to remember using it as a kid, but personally I would avoid fiber glass decorations because I’d be afraid of health effects. Sometimes it takes a long time to discover the connection. For example, asbestos causes mesothelioma, but it can take 20-40 years from the time of exposure to the time of getting cancer! And they used to sell artificial asbestos snow. If you happen to have any old snow that might be asbestos, don’t use it! You can try selling it on Ebay and a lawyer might buy it, but whatever you do, keep it sealed up well and don’t expose yourself or your family. So my point is that what once seemed like a safe decoration is now recognized as hazardous. Is spun glass as dangerous? Probably not as bad as asbestos, but I’m really not sure. Would you use spun glass Angel Hair for Christmas decorating? *Can* it be annoying? Yes. (Then again, that can go for 1-5% of Christmas Guests!) But, properly laid out on a lit Christmas tree…it’s MAGICAL! My Mother, passed away in 2010 was an Artist with it! Childhood memories… ~sigh~ Simply use with some common sense! ABSOLUTELY!!! As a matter of fact i was just looking on line trying to find real Angel hair for decorating this Christmas and to use in making my Victorian ornaments. I found it!! Hobby lobby carries it and i also found it on Amazon. Right now it’s on sale at Hobby lobby, so check it out. BTW the only way you might have a problem with it is if you either whaller in it or try to eat it! Both would be pretty stupid. Merry Christmas ya’ll! Absolutely will never have it in my house again. I bought some at a thrift store thinking it looked nice and thought i might use it on my mantle. Big mistake, it is like fine shards of glass. Very hazardous, painful, itchy. Terrible!!! 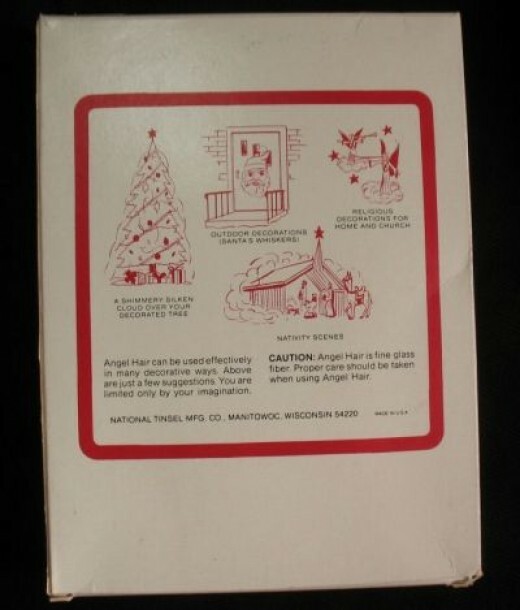 my mom always used this at christmas, right up on top as a nest to set the angel in, and yes, it looked really pretty. but i also remember as a kid how i kind of hated it because i would ALWAYS get some tiny piece stuck straight into my foot or hand and it being a total pain to get out! its pretty dangerous if you have kids in my opinion! not worth the annoyance! From what I heard it was highly flamable too! My Dad wouldn’t let the stuff in the house, not even back then. We used it a couple times when I was young, but had to stop because I reacted so badly to it. But it sure made a beautiful display on the tree. I’m not sure it is safe for anyone now. I don’t use it. My mom used to use it, but I think she has gotten rid of it in the past few years! Use common sense. Don’t sniff it or eat it or shred it up, it is glass. Just use as a decoration. It’s only going to be use for a month (at the most) each year. I used to decorate with it….but then I couldn’t find it any more…What a difference it made compared to that heavy cotton stuff you can only get now….I miss it! It sure made a beautiful Christmas Village…wish it wasn’t so hard to find.But like everything else…there’s always sombody out there to put the kaboch to something that works..I guess some people just have to much time on their hands!!!! Merry Christmas to ALL…I’ll probley be getting alot of feed back on my Wishes TOO!!! Well it’s been 60 years since I was first exposed and exposed every year for the next 20. Still kicking with no ill effect. I think the possibility of health hazards overstated. It’s beautiful and not flammable. Absolutely YES angel hair is a long fiber and not likely to become airborne and if it makes you itchy we now have these great latex gloves. It’s gorgeous and not that unsafe. The kind I have is actual spun glass which won’t catch fire, but melts instead, when coming in contact with flame. It’s not a fiber that can float around in the air, but long strands of glass and it stays where you put it. I put a string of multicolored minilights on my mantel, then clouds of angel hair over that, and it’s absolutely beautiful. I re-use my supply, but will eventually have replace it because dust does settle in it, so it’ll start to look old after a few uses. I have used it since, well, that I can remember. My dad put it on our tree every year. I’m 44 so this wasn’t just a “60’s” thing. Now my kids are grown and traditions are changing, but I never thought that Angel’s Hair would have to be one of them. In the last couple of I just CAN’T FIND IT ANYWHERE, and that’s sad. It is so beautiful when the tree lights glow through the spun glass. Whoever hasn’t experienced this on trees…you really missed out. Previous Does coffee make you shaky?